Organizing 2.0 trains online organizers in social media, digital strategy and other fields related to ‘the online digital arts.’ Among the issues raised in our trainings is the problem of professional bias. Communication directors who were trained in strategic communication and press relations are often biased in favor of message control, print and commercial electronic media, and the news cycle. It happens that many deal poorly with real time media, interactivity, and the elevation of amateur voices to the fore. Webmasters/IT Staff are often technically minded web developers who took on the role of ‘online content manager’. They are often biased to see the website itself as the core function of digital media. It happens that they are often weak at offering digital strategy leadership, and sometimes a little too eager to suggest coding fixes to strategic problems. Organizers are generally oriented to ‘real world’ activities like meetings, signup sheets, phone calls and events. The role of online engagement is often misunderstood, as expressed by flawed/incorrect mentions of the ‘digital divide’ or pejorative phrases like ‘slacktivism’. What this means to the budding growth of ‘digital strategy’ as a professional niche, is the importance of recognizing these kinds of entrenched bias. Leaders and grassroots activists alike can be alert for signs of the bias at work, to surface it openly where it can be treated with the best disinfectant: exposure. After all, there is plenty of evidence and resources to overcome the blind spots mentioned above. Unfortunately, most of us encounter bias under circumstances where we can’t address it squarely. What if the bias is coming from someone with status power, and the culture doesn’t allow you to challenge their assertions? Or if the bias holder insists that her assumptions are valid and beyond question and is impervious to change? Or if you are able to recognize the bias, but not skilled enough to address it in the moment? One of the unpleasant professional memories I hold comes from a time when one of my managers insisted, publicly, that one of our consultants had said A when in fact he said B. It didn’t help that I went back and got written clarification from said consultant…. Much like climate denial, professional biases aren’t necessarily rooted in fact. Culture eats strategy for breakfast. What’s happening under the surface is that someone’s communications frame is very securely attached to their brain, making it hard to process information from outside the box. But right now, we’ll try and change that. With some advance preparation, those very same ‘frame hostages’ will not only adapt but convince themselves that they never even thought that way in the first place. Excellent. The frame changes from ‘I understand the important part of communications so let’s do it my way’ to ‘my expertise is mostly in one quadrant and I’ve got a lot to learn from experts with different specialties’. At least, one hopes it does. And if not, at least you’ll be able to articulate precisely what’s wrong with your communications operation. Purpose: “Purpose creates 21st century movements.” Founded 2010. Fission Strategy: “Fission Strategy helps social causes harness social media for social good.” Founded 2008. Echo Ditto: “We guide leading social change organizations and social enterprises through their use of connected media and emerging technologies.” Founded 2003. I’m writing these words while attending the International Labor Communications Association conference. The slogan on the podium banner reads ‘The Power of Labor Journalists United.’ The roots of this organization are in the labor press going back more than 100 years. I suspect that the future of labor communications will sound a lot more like the copy from these young communications firms. 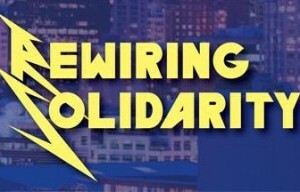 The International Labor Communicators Association (ILCA) is having its biennial conference in Seattle this week, September 21-24. I’ll be attending for the first time and invite all those who care about or work with the labor community to catch up on the work of this important organization. The first thing to understand about ILCA is that once upon a time it was ILPA – the International Labor Press Association. The labor press has a grand and storied history in the United States. There was a time when newspapers produced by and for union members competed successfully with the establishment press. Labor journalism wasn’t simply about labor struggles, it was the entirety of journalism, covering all fields of human activity – but from a class conscious perspective. For many of us on the front lines of progressive organizing, the importance of the labor press might not be readily apparent. The fact is, there has been a decline of the labor press for a variety of reasons, the most important of which is that the labor movement is in crisis. But for union staff, grassroots leaders and the engaged rank and file, newsletters and magazines published by the union are sources of great pride. That said, print publications were mostly founded long before unions members had access to the internet. We know what the internet did to regular newspapers; perhaps the same process is taking place in the labor press. I first learned about ILCA in 2009, while working for the Working Families Party in New York. As an online organizer, I wanted to know: what exactly is a ‘labor communicator’ in the 21st century? Does it include bloggers on labor issues like Laura Clawson and other Kossacks? Does it include webmasters who manage content without producing it? What about those who draft emails, or use online communication tools for organizing? My answers to these questions come from private conversations I’ve had with ILCA members and leaders. Let’s remember that ILCA was built around labor print publications, and membership was often related to the specific publication and how many copies were circulating. That said, the folks in charge weren’t ignorant of the rise of the internet, the shift of content to the web, the rise of self-produced video and audio content, and the reduction in budgets for print publications. An example of how they are adapting can be seen in the annual awards programs they run, which include categories for websites and use of social media. The last few ILCA conferences featured a website devoted to the host city, with content created by the conference delegates. This is the Pittsburgh Media Center, from 2009. This is the New Orleans Labor Project, from 2007. After next week, you’ll see the Seattle effort, with a mix of stories chosen by the conference organizers and assigned to attendees. This activity is a great way to highlight the role of labor journalism and gives members a chance to showcase the great work they can do. While celebrating the role of labor journalism, it might make sense this year to have a broader conversation about the future of labor communications. I asked the folks at UnionJobs.com to send me data about job descriptions in which the word ‘communications’ was mentioned. Looking them over for the past few years, it’s clear that a number of job categories are changing. First of all, there is greater need for more technically skilled staff to work directly within union departments instead of as consultants or with vendors. Producing video on a regular basis using flipcams is different than hiring someone to make a well-produced video for a specific purpose. Is the union member using flipcam video as part of an organizing campaign a communicator? What about the staff member who distributed 20 cameras in the first place? Second, email, web and social media communication channels are being used across departments and for different purposes than newspapers. While there are fewer jobs devoted to writing stories about labor, more and more have to engage in story-telling and mass communication as part of their job. Third, we have the rise of a new function, not yet well integrated into the structure of the labor movement. Call it ‘digital strategy.’ In the good old days, important campaigns might have had access to ‘strategic campaign consultants’ who focused on messaging, and to a lesser extent press relations and advertising buys. But today, as important as those functions are, their practitioners are often absent when decisions have to be made about responding in real time to social media, adopting new technologies, implementing tools across staff roles, and keeping in close contact with those outside the labor movement working in the same professional space. There’s a reason why SEIU created a new department for New Media that was separate from the pre-existing Communications department. It is probably true already that the number of webmasters, videographers, email campaigners, web content producers, bloggers, and digital strategists working in the labor movement rivals the number of those involved in print publications. Do they see themselves as ‘communicators’? Does ILCA see them as future members? ILCA’s website doesn’t actually define what it means to be a labor communicator, but just about everyone I’ve spoken to agrees that it has meant ‘content producer’ in some form or another. Print, video, graphic and audio content. It has not, traditionally, meant the kind of union employee who graduates from an online organizing training, or who is managing their local’s Facebook page and Twitter stream. Most of the staff performing those functions have never heard of ILCA. The upcoming conference’s keynote speaker is Nation correspondent Jon Nichols, who reports often on labor issues. But they will also have Scott Goodstein of Revolution Messaging, a mobile phone campaign vendor, and Jason Mann, the producer of a recent series of training videos for labor folks using social media. It seems that a shift is underway, but the parameters of it are closely held. We know that a conversation about it exists, but we can’t read about it in advance, and there isn’t any space for discussing it online in advance. I can’t help but wonder what an ILCA conference would look like in two years, and who will be attending. What fraction will work with or for print publications? How many will be primarily organizers? Will the emphasis remain on content production, or move in the direction of digital strategy? As an associate member who doesn’t work for a union, I’m not sure I have any ‘shoulds’ to offer. ILCA should be whatever it wants to be. But I’m very curious about what the current executive members and delegates think. Do you want to be different than what you are? Who do you think you need that isn’t already in the mix? Is that a conversation you’d like to have using new media where it would be transparent, interactive, and outside of your control? What do you think? I’d love to hear from labor communicators of any stripe.